I had a friend, that up until recently, lived in Seattle. I would go up once or twice a year to escape the heat and pretend to be one of the granola eating, Chaco wearing hippies of the great northwest. 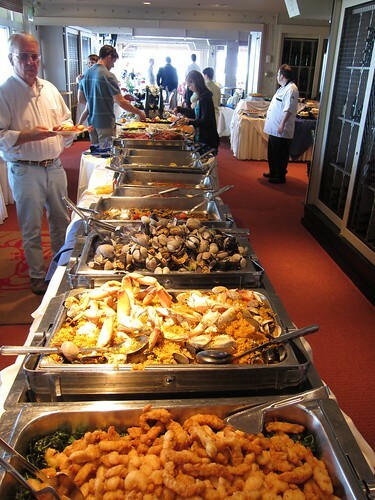 Whenever I go, I make sure to do 3 things 1) eat as much seafood as I can stomach 2) drink as much wine as possible 3) eat a giant brunch on Sunday. 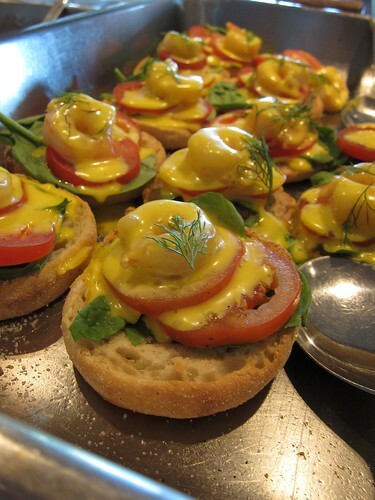 Creamy hollandaise, big lumps of salmon, crab and shrimp all on a perfectly toasted english muffin. Perfection. 14 Carrot cafe also happens to have another treat particular to the Pacific Northwest, freezer jam. 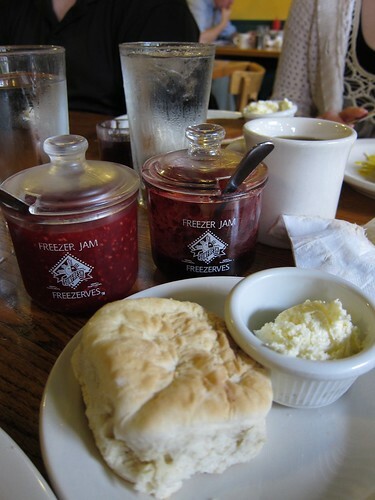 I had never encountered freezer jam until I started visiting Kasie in Seattle. Basically, freezer jam is jam that's not cooked, its frozen to kill any germs that might infect an improperly prepared jar of jam. When you want to eat it, you just thaw and enjoy. Now, it won't last very long, not longer than few weeks, since its made from fresh fruit, but good luck if you can get a jar to last that long in your house. They last about 2 days in my house. Just north of Seattle proper, is a small town called Woodinville. For whatever reason, it has become the wine tasting capital of Washington. In a two square mile radius, you can taste wine from about 50 different vineyards from all over Washington State. 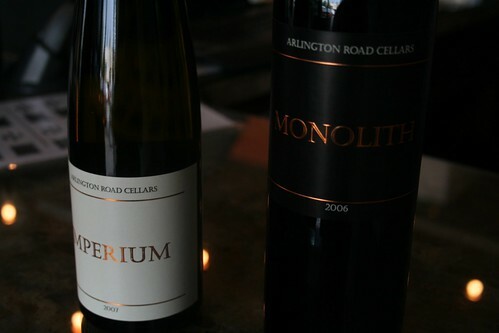 All the little small volume mom and pop wineries rent spaces in several industrial strip malls all over Woodinville for your tasting convenience. Hence satisfying Seattle Food Rule #2, drink as much wine as possible. There are several wine-o strip malls, but there is one in particular that I always head to. It's on 144th Ave NE. It doesn't even have a name, its just a strip mall, but there are literally 20 delicious wineries in one convenient strip mall. Just make sure you come with a designated driver. Trust me. Sundays are generally travel days when I take weekend trips, but I always make sure to catch an afternoon flight so I can have brunch in Seattle. We always go to Salty's on Alki (don't go to the other Salty's, just the one on Alki). It's expensive, at $45 per person, but it's well worth it. 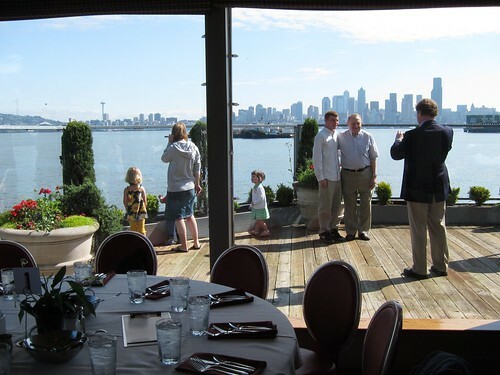 First, you get to enjoy THE best view of Seattle from across the sound. 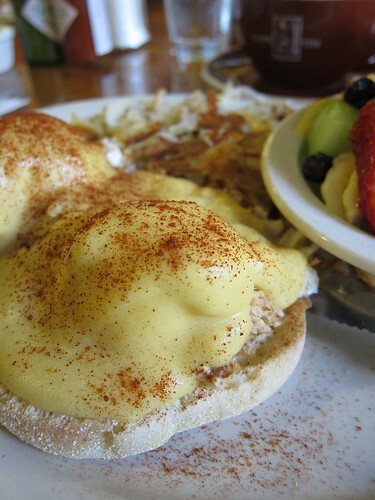 Second, you get to pig out on over 30 delectable dishes. This is half the buffet.. Really. 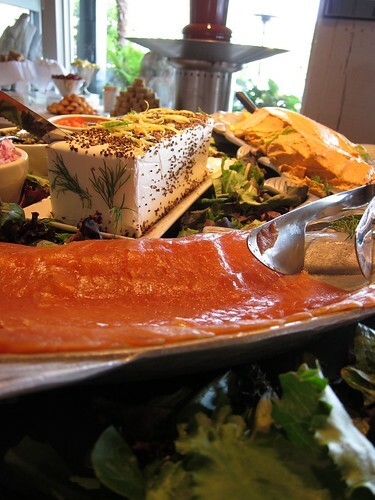 Did I mention they have THE best smoked salmon on the planet (check out the block of artisan cream cheese). 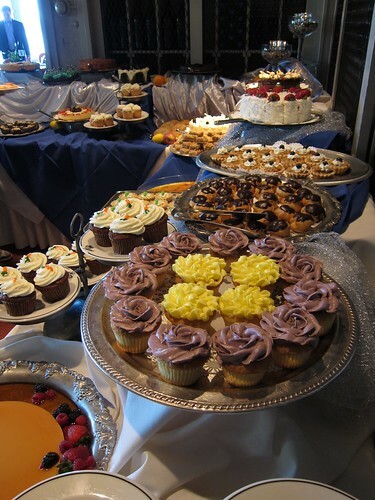 Probably the single best part of the brunch at Salty's is the Dessert Bar. The dessert bar was so big I couldn't get it all in one shot. This is HALF the dessert bar. ZOMG, death by sugar. But it would be a sweet death. 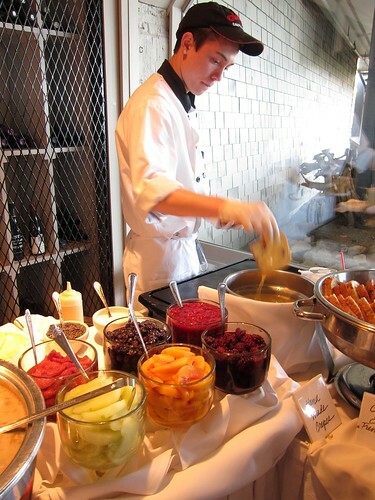 Do you see now why Seattle Food Rule #3 is eat a giant brunch?? And finally when I'm all full and happy with a (checked) suitcase full of wine, I head home with fond memories of cool afternoons and nippy evenings; of salmon and cupcakes; and little jars full of freezer jam.